Were we successful at accomplishing our three goals? We left Cottontail on the Trail and headed east to Minnehaha Falls, which was beautiful as always. I was a little worried about starting out on a bike ride at naptime, but KP just slumped over like a sack of potatoes and fell asleep. But when she heard talk of iScream from Sea Salt, she perked right up. Then on to Fat Lorenzo’s, where we enjoyed the gelato in the shade of a tree in Lake Nokomis Park. Then on to Pepito’s, for some excellent burritos. Big thanks to everyone that attended this year. I hope everyone had fun. If you couldn’t make it this year, maybe next year, huh? Announcing the annual Collins Family Cyclefest 2012! This will be the third Cyclefest, much anticipated after a disappointing ball-dropping omission in 2011 from the ancient tradition began in 2009. Collins Family Cyclefest 2012 is a friendly bike ride around the neighborhood where we stop and enjoy some refreshments along the way. The ride will be slow-paced, and families are encouraged. If you’re reading this, you’re invited. No need for us to have met before or have anything in common, other than that we’re all riding bikes. We’ll meet at Cottontail on the Trail, a bronze bunny located at the intersection of Minnehaha Parkway and Portland Avenue. The ride will begin at 10:30 AM sharp (sorry about naptime) on Saturday, June 30th, 2012. That’s two weeks from now, suckas. Here’s the 9 mile route. 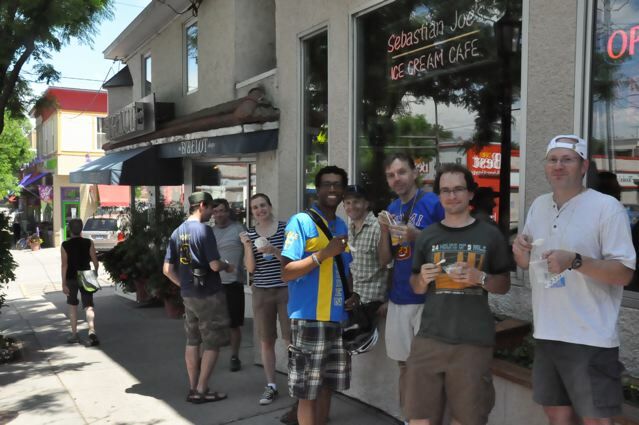 We’ll start at the bunny and head down Minnehaha Parkway to Minnehaha Falls, where we’ll enjoy some iScream at Sea Salt. From there, we’ll make our way to Fat Lorenzo’s, where we’ll enjoy some tasty gelato. 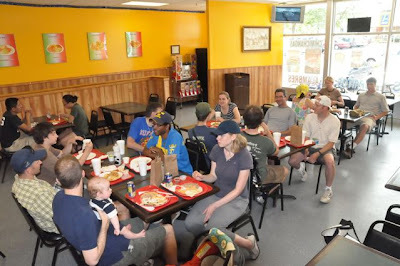 Finally, we’ll continue to Pepito’s, where we’ll end the day with a great burrito. Of course, you’re welcome to come along and eat or not eat any of the stops, and you’re welcome to peel off from the group at any time if you don’t want to make one of the stops. Sound good? Cool! See you there! Will there be a CycleFest 2011? Great Question! The short answer is YES! Will we have a box bike to take Kung Pao along with us? How old does Kung Pao need to be before we can take her on a bike? How long will we need to wait after birth before Mel feels like getting back on a bike? Would Collins Family Cyclefest be worth having if Mel didn’t come at all? Is it still Collins Family Cyclefest if Kung Pao doesn’t come? How do we set a preliminary date if we don’t know the answers to the rest of these questions? Anyway, so that’s what we’re struggling with right now. At the very least, we can assume it is more likely to happen in the late summer or fall than anytime soon. We’ve also established that a 10-15 mile route we tried in 2010 was much more popular than the 50 mile route we tried in 2009. But more importantly, what would the route be? Last year we did ice cream and tacos. How about this year? Hot dogs? Pizza? Organic Smoothies? Let me know what you’d like to see on CycleFest 2011? Author Posted on March 17, 2011 April 10, 2011 Tags ask me anything, biking, cyclefest2 Comments on Will there be a CycleFest 2011? CycleFest 2011: Tour de Taco was a smash hit! Thanks to everyone who came. I think everyone had a good time. We had a great turnout of about 20 people, including notable bloggers Ed, John, Julie, and Katie. I met a few new people and I hope everyone walked away with a few new friends. Nobody died or had heat stroke or anything, and only one persons bike broke (but nothing a quick stop at a hardware store along the route to get some superglue & duct tape couldn’t fix). We hope to see everyone again next year for a new route and new adventures!! What is it? Cyclefest 2010: Tour de Taco is a bunch of normal peeps who happen to enjoy 3 things: Bikes, Ice Cream, Tacos. 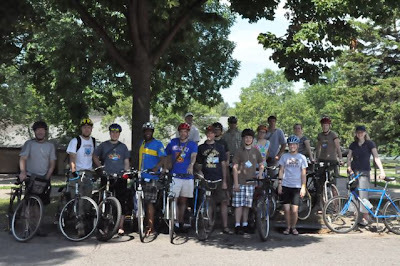 We will meet at Powderhorn Park, then zig-zag on bikes across South Minneapolis stopping at a couple of our favorite locally owned ice-cream and taco joints. 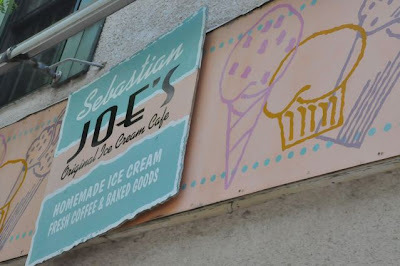 At each stop, we eat ice cream & tacos, chat it up, and take a break. Then we ride to the next treat. Who is invited? Anyone! Everyone! Invite your friends! In a bold move, I’m encouraging my social circles to collide for one day only. So whether I know you from school, church, the interwebs, or somewhere else, it doesn’t matter. Hopefully we’ll all meet some new people and make some new friends. What cycling skill level is required? The official route is 14.2 miles long, the majority of which utilizes off-street trails. Families & kids are invited and encouraged. If you don’t think you’re up for the whole 14 miles, let me know, and we’ll make arrangements for you to complete only the portion of the route you’re most interested in. 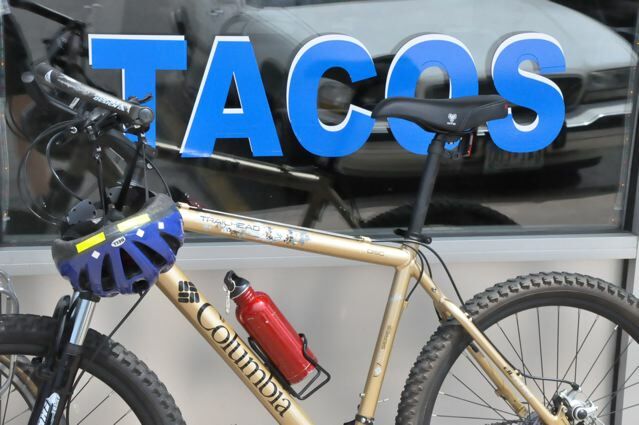 Maybe you just meet us at the first stop, ride with us to the second stop, and head home from there (or maybe you meet us at Lake Calhoun, ride with us for tacos, then head home after that… or whatever…) The full route and each of the stops can be found here. Bring a friend and a bike! See you at 11:00 AM. Announcing the 2nd Annual Collins Family Cyclefest! Cyclefest 2010: Tour de Taco will be held on Saturday, July 17th, 2010 (11:00 AM). What is it? Cyclefest 2010: Tour de Taco is a bunch of normal peeps who happen to enjoy 3 things: Bikes, Ice Cream, Tacos. We meet at a central location in South Minneapolis (Powderhorn Park), then zig-zag on bikes across South Minneapolis stopping at a couple of our favorite locally owned ice-cream and taco joints. At each stop, we eat ice cream & tacos, chat it up, and take a break. Then we ride to the next treat. What cycling skill level is required? Low – the route hasn’t been finalized, yet (see below), but it will probably be about 10 miles or less and involve numerous and lengthy rest stops. The route will utilize the regional trail network and low-traffic-volume side streets as much as possible. Families & kids are invited and encouraged. Even if we’ve never actually met IRL before, you should come anyway! I’d rather eat sherbet and burritos, is that ok? No. If you can’t get with the program, stay home. Yes, you can eat or not eat whatever you want at each stop. Also, you can join up with or peel off from the group whenever your belly is full or you find something better to do. Did you think of the name Tour de Taco all by yourself? No. I stole the name from someone else. I should also give credit to some local ladies named Abby & Erica who host an annual Tour de Ice Cream. The only original thing I’m doing here is mashing up the two events into one. But who says we have to be original to eat ice cream and tacos? How can I help? 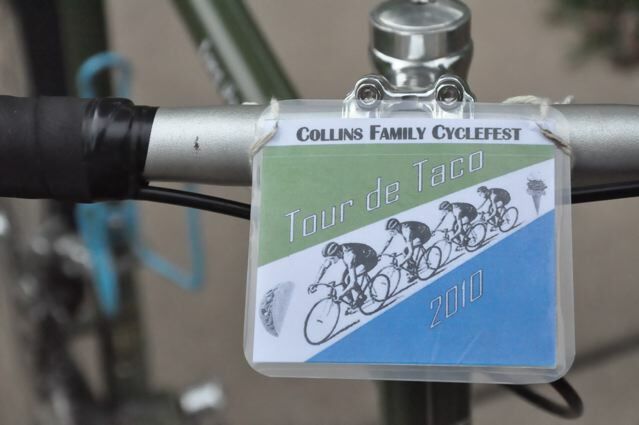 There are three ways you can help make Cyclefest 2010: Tour de Taco a success! 1. 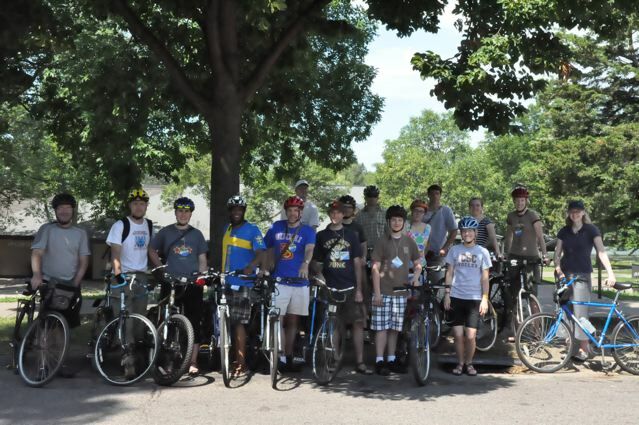 Show up at Powderhorn Park on July 17th at 11:00 AM with a bike and an appetite! 2. Bring your friends (who should also bring bikes and appetites)! 3. Leave a comment below with suggestions of your favorite locally owned South Minneapolis ice creameries and taquerías. [EDIT Final Details are here]. Everything went smoothly, other than a couple flat tires. Luckily, the smartest Cyclefest participant remembered to bring along a patch kit, and was also smart enough to rip a hole in his tire right next to K-Mart so he could easily purchase a new tire. Well, that’s all the photos I’ve got. What? No photos of Leo’s? Or Stillwater? Or the giant hills? er.. no.. next year we will have to designate someone ELSE to be the official photographer. This Saturday, July 11th, 9:00 AM. Bring yourself, a water bottle, and a bicycle to the Collins household this Saturday (July 11th) for our annual Cyclefest. This year, we will be cycling to Stillwater and back using a combination of urban streets and off-street bike trails, including the Gateway State Trail (always a treat!). When we get to Stillwater, we will eat lunch at Leo’s Grill & Malt Shop (careful not to overstuff or you’ll have a miserable ride home…). Then we’ll do whatever we want for however long we want (how’s THAT for planning, eh?). We can let our overstuffed bellies rest while we stroll main street, take a break, photograph the historic lift bridge, take a swim in the St. Croix, nap, or buy overpriced goods at niche luxury stores! Total round trip will be about 60 miles. If we maintain a leisurely 12 mph pace, we’ll be in Stillwater by 11:30. Lunch & stuff will take until about 1:00 (or until we’re bored) and we should be back at my house by 3:30. The route & pace will be geared towards novice cyclists – so don’t let inexperience keep you away. Weather forecast for Saturday is 82 degrees and sunny. Some folks have expressed interest in driving to Stillwater to meet the group for lunch. Know that we will probably make fun of you and possibly belittle you behind your back, but don’t let that keep you from coming. I estimate we’ll be in Stillwater at 11:30, but you should probably use cell phones to coordinate with someone in the group while we’re cycling so that you can show up at the right time. I have unfounded fears about posting my address online (even though it’s public info anyone can find online…), but I’ll tell you that it’s on the 33xx block of 15th Ave S in Minneapolis near Powderhorn Park. So just show up and look for some peeps on bikes, or send me a private email and I’ll tell you the actual address. If you know you’re coming, I’d appreciate an RSVP so we can get a head count, but feel free to just show up on Saturday morning, too.